Stéphane Lissner, directeur of the Paris Opéra since 2014, has been told that his contract will not be renewed beyond 2021, it is officially confirmed today. Sources are saying the decision to replace him has been manipulated by President Macron’s director of communications, Sylvain Fort. A previous version opf this story misread a key element. A more likely replacement would be Maurice Xiberras who’s had Marseille for some time. Outside bets on Claude Cortese from Nancy and Valerie Chevalier from Montpellier. Chevalier is not suited to such a job, she has only very vague ideas about classical music and does not know how to communicate with musicians. Sounds like the perfect fit, then. The current version of the story still misreads a crucial element. Mr Fort is not in line to succeed Mr Lissner, he was just instrumental in Lissner’s demotion. The name of Mr Lissner’s successor is not yet known. You are spot on. Who else can compete ? He was brilliant in Vienna, he would be a perfect fit in Paris. Thank god his „brilliant“ tenure comes to an end. At least in Vienna! Dominique Meyer was an excellent Director at the Theatre Des Champs – Elysees for some years ( in the early 2000s) so is no stranger to Paris. The seasons during his tenure were first class. This makes complete sense. 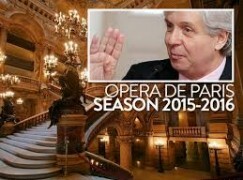 Sylvain Fort knows a lot about opera, Lissner does not. Good on him for forcing this change. What is it about the French obsession with heads? They are intensely political appointments. Governments can’t get enough of placing ‘right-minded’ people at the heads of their institutions. Is Algot’s comment that Dominique Meyer was “brilliant in Vienna” some kind of belated April Fool’s Day joke? Clearly Algot never experienced the Golden Age of Egon Seefehlner’s administration. Monsieur Meyer was the worst thing to hit the Wiener Staatsoper since the Allied bombing in March 1945.